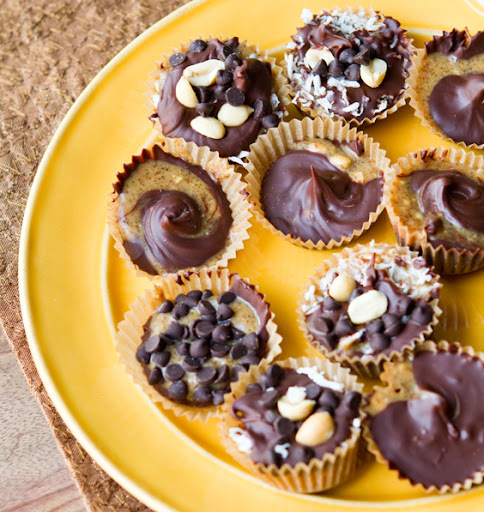 Homemade Halloween Treats: Chocolate Candy "Bar"
Presents on Christmas. Flowers on your wedding day. Fireworks on the Fourth of July. Hot Cocoa on a snowy day. Candy on Halloween. Some traditions were meant to be embraced. 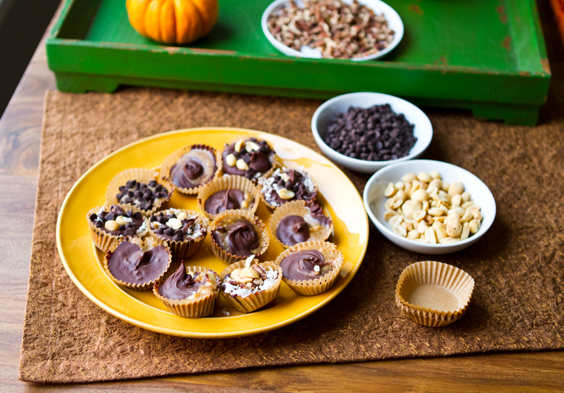 I'll show you how to embrace your cravings for chocolate Halloween treats - but this time, try your treats homemade and vegan. 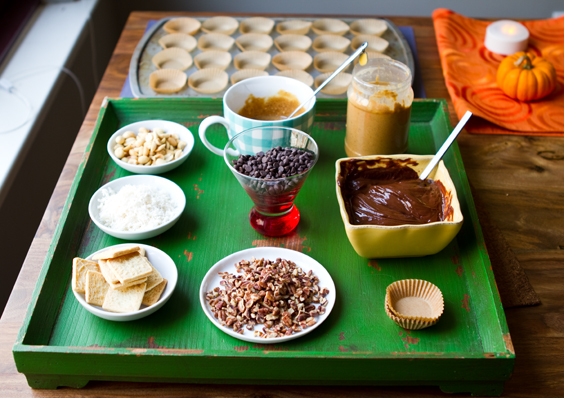 Create a candy-making "bar" featuring do-it-yourself treats like peanut butter cups and more. Mountains upon mountains of bagged candy clutters stores shelves this time of year. Crinkly golden, blue and bright orange wrappers all begging to be plucked and tossed into treat bags. I find myself walking down the "Halloween candy aisle" at a drug store and suddenly memories of peanut butter cups, Snickers bars and peanut butter Twix waft through my head. But most of those famous Halloween treats are not vegan. The answer: wallow in sorrow? Feel left out? No way. I love to veganize childhood faves - and that includes a few Halloween treats! Traditions don't have to go away - they can simply evolve and change into something new. Tofurky on Thanksgiving. Vegan candy on Halloween. 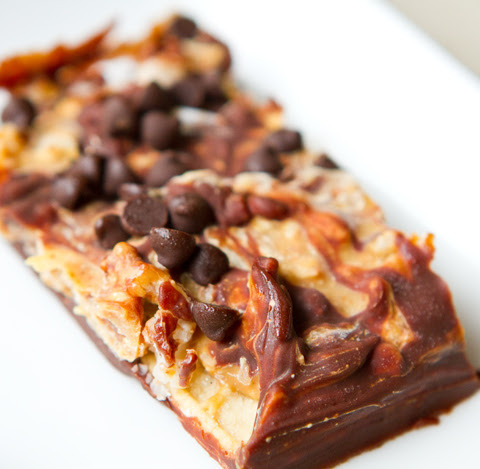 This year I'm making my own Halloween treats via my Vegan Chocolate Candy Bar Bar. 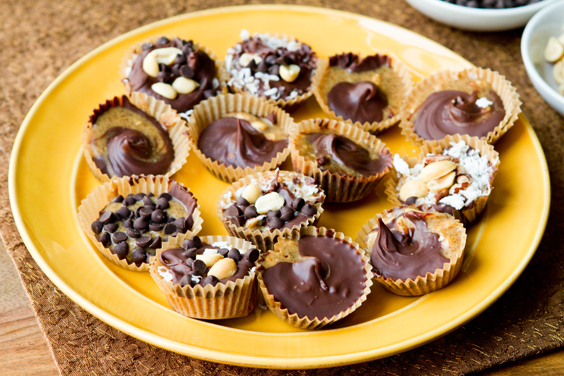 Making your own candy is easy, fun and the end result is delicious! 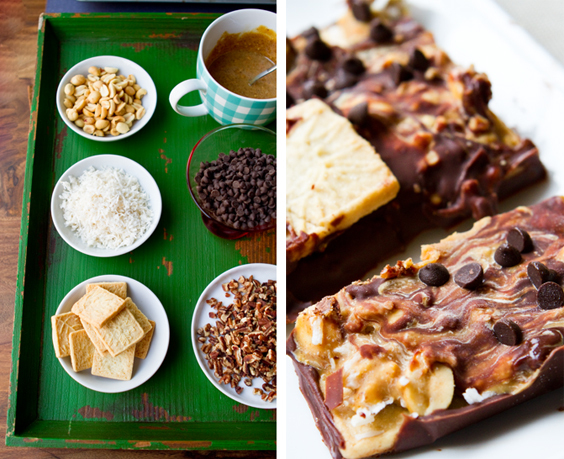 You'll feel like the vegan version of Willy Wonka. 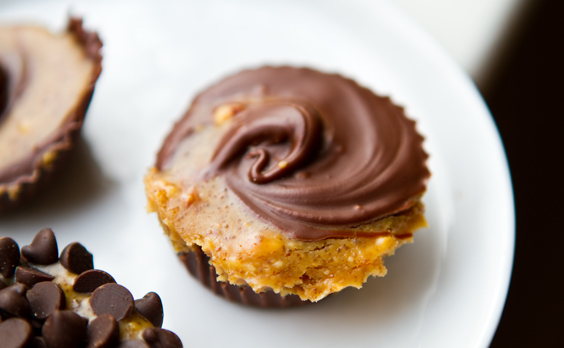 Today I'm featuring peanut butter cups and peanut butter cookie bars, aka Twix. The secret to good candy at home is to start with a spread of high quality, delicious ingredients and use your creativity to dream up some creative confections. Vegan Chocolate can be tricky. There are three chocolate chips that I like a lot. Enjoy Life's mini chips are very allergy-friendly and vegan. I also like Whole Foods 365 brand "vegan chocolate chips" and then lastly, I can usually find a few brands of dark mainstream chocolate that is dairy-free - although usually "produced in a factory that uses dairy." Either option will work. And if you can not find chips, look for vegan chocolate bars and melt those down. 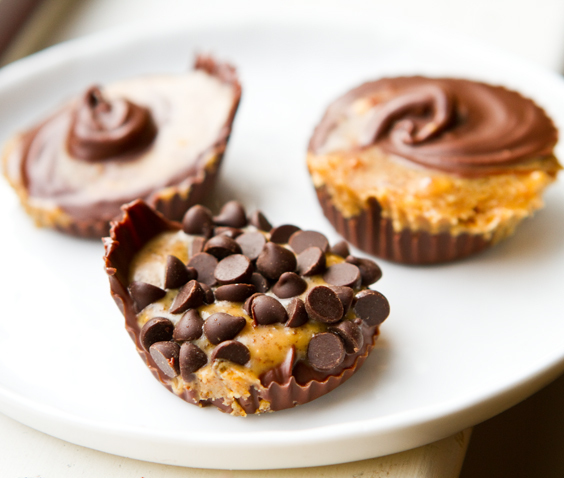 Mini baking cups (or regular sized) are a must for peanut butter cups - you'll get those lovely crimped edges. 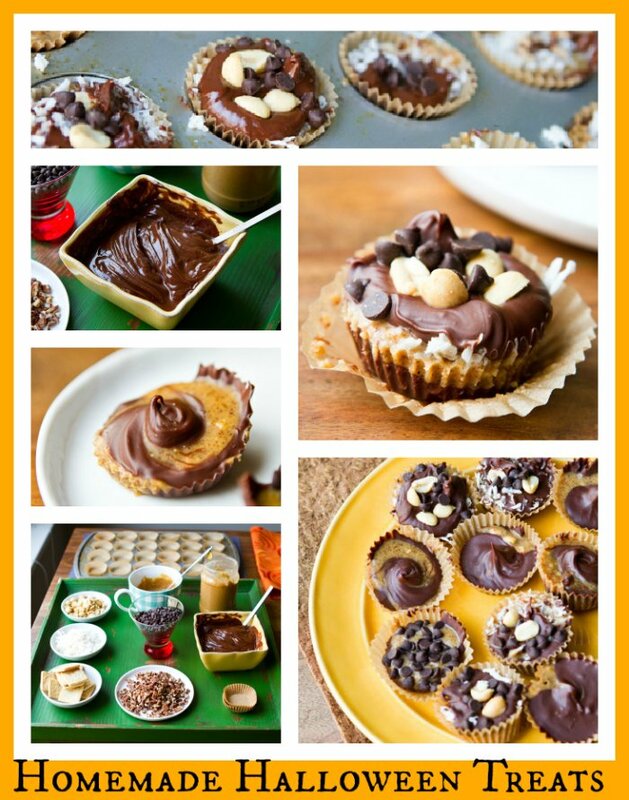 To Make: For the peanut butter cups..
1. Melt down the chocolate base via a double broiler. Do not burn chocolate. 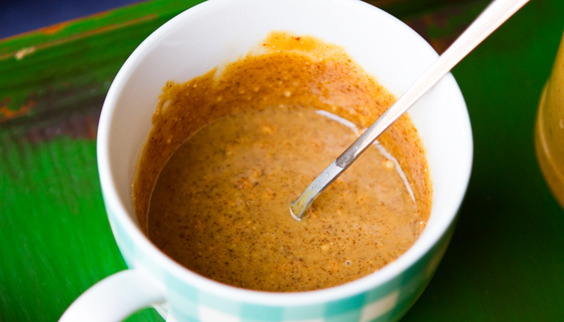 Also melt and stir the peanut butter base. 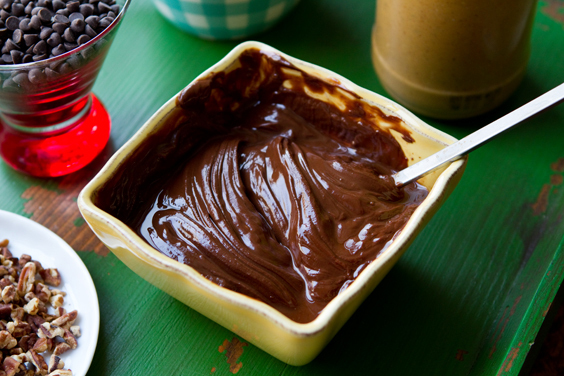 A simple 30 seconds in the microwave should melt the pb ingredients together. 2. 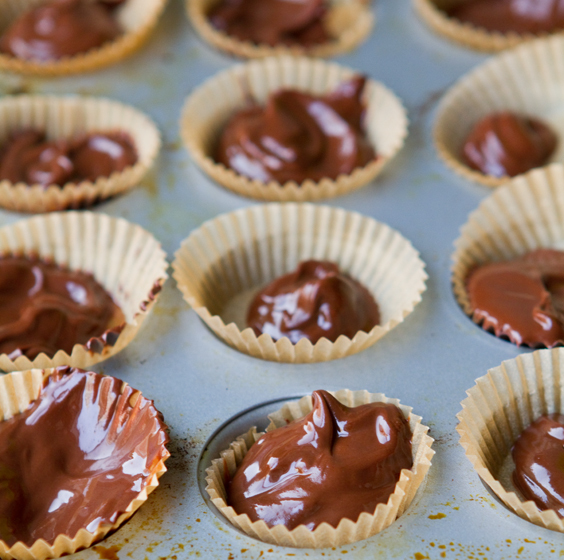 Add a dollop of chocolate base to each baking cup. 3. 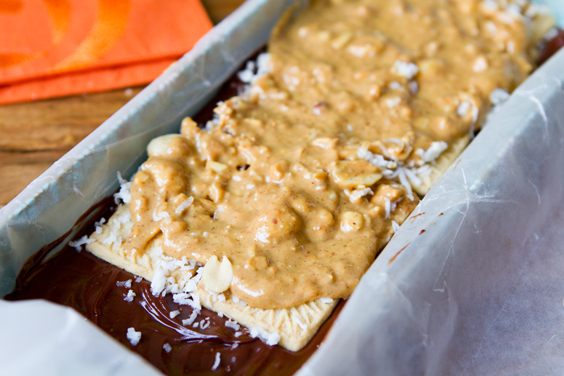 Add a dollop of peanut butter filling - it will be water, but that's OK.
4. 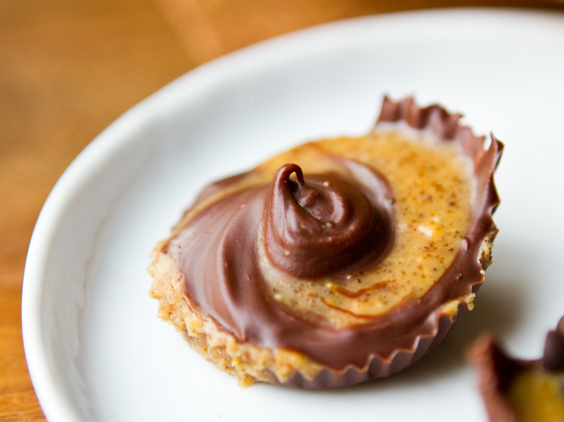 Add any additional fillings, press into the pb/chocolate cups. 5. Add a final small dollop of chocolate. 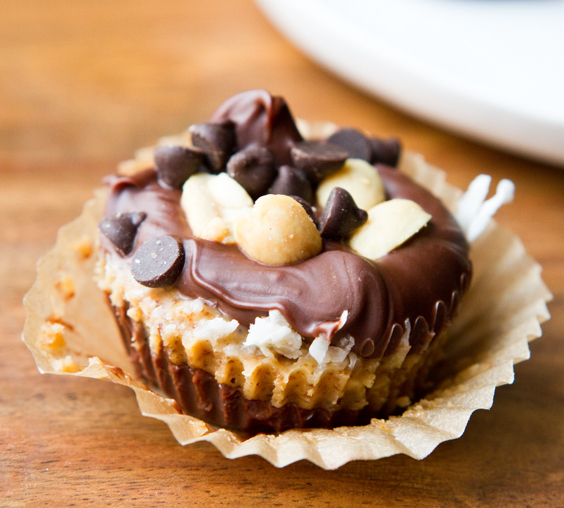 You can swirl it into the pb or simply plop on top. 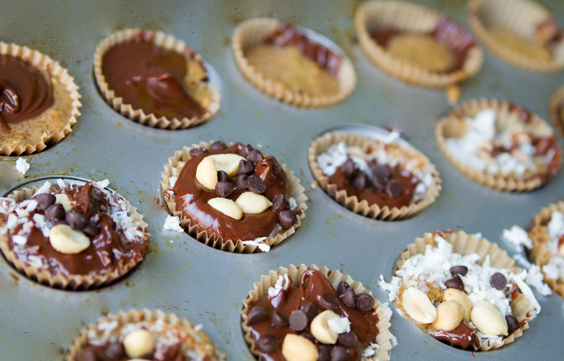 Get creative and don't worry if it looks messy now - it will firm up in the freezer nicely. 6. Add any final toppings. 7. Place in the freezer for at least 15-20 minutes. The chocolate will be nice and firm by then. When ready to serve allow just 1-2 minutes to thaw to room temp. Serve! Store in the freezer. These cups will keep weeks in the freezer, however the pb filling does tend to dry out and fade in color a bit after a few days. Need a spot to store your Halloween goodies?.. 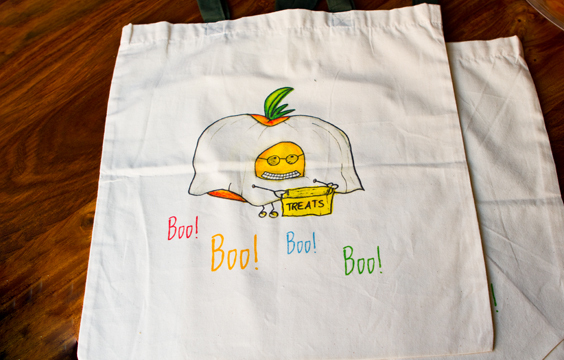 Smarty-Ghosty-Tomato Lunchbox Bunch canvas Halloween treat bag..